Whatever method you use to create a form, you will find good suggestions for questions to use at the end of this page. You need to have a Google account. If you don't have one, get one from the Google search site. Then, go to the Google search home page. Log into your Google account from the upper right corner. Use a template as a start. Create your survey form without a template. First, go to this page about how to create a survey. Click the link in that page's Step 1, it leads to this page. Click on that button to start with a blank form, or use a template as follows. That will open up more template options. If you are planning to create a survey, I suggest that you start with the template named Event Feedback. But other templates may be suitable as well. When Drive opens, go to the upper left area and click on the blue New button (see illustration below). A menu opens which lists the types of new Drive documents you can create. Look for the Google Forms option. If you do not see it, click on the More option at the bottom of the first menu. A new blank form will open. The QUESTIONS mode will be pre-selected (above the form header). Fill in the Form title. Then click on Untitled Form in the upper left corner. It ought to automatically adopt the Form Description text. Or you can create a different name. 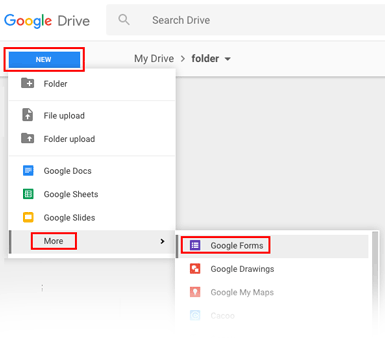 The name you use is the name that will be seen in your Google drive list of documents. Fill in the Form Description line. 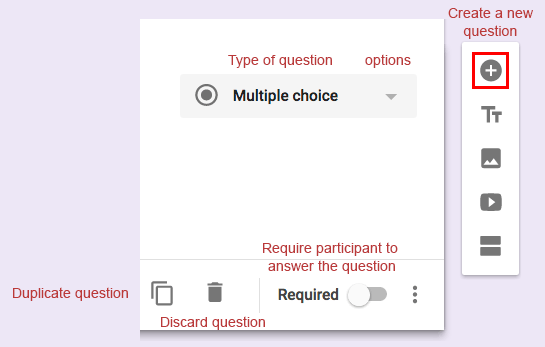 The QUESTIONS mode (above the form header) allows you to create and edit questions. There will be one multiple choice question already in place. There will be a vertical set of buttons on the right side of the form. Use the plus button to add a question. You will have a choice of the type of question you want to add. Survey Questions 101: Do You Make any of These 7 Question Writing Mistakes? - advice about how to write questions.